This filament extrusion line is equipped with a single-screw extruder, controlled cooling bath, haul-off unit and winding system. AIMPLAS, the Spanish Plastics Technology Centre, has set up a new extrusion line to create filaments from a wide range of thermoplastic materials that can be used to 3D print parts by means of fused deposition modelling (FDM). This filament extrusion line is equipped with a single-screw extruder, controlled cooling bath, haul-off unit and winding system that can obtain filaments with thicknesses of 1.75mm and 2.85mm, and can be modified for other thicknesses. 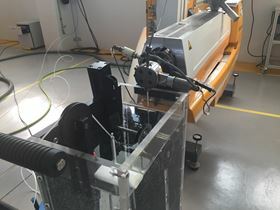 Due to this new equipment, the Plastics Technology Centre is already able to process conventional, technical and biodegradable plastics, elastomers and modified materials, making it possible to identify commercial materials that can be used to produce filaments and develop improved materials using physical or chemical modification to meet customer requirements. It will make it possible to modify materials in order to change their conductivity, solubility, antimicrobial qualities and so on, AIMPLAS says. The filaments extrusion line is complemented by a complete range of 3D printers to produce prototypes. AIMPLAS is able to obtain designs by using flexible or rigid filaments of materials with a melt temperature up to 350°C. The different parameters that take part in the 3D printing process can affect the part’s aspect and final properties significantly. This story is reprinted from material from AIMPLAS, with editorial changes made by Materials Today. The views expressed in this article do not necessarily represent those of Elsevier. European plastics organization AIMPLAS has developed improved graphene particle concentrates for conventional plastics processing and AM. BASF and 3D printing company Materialise are investing in Essentium Inc, a Texas-based developer of materials for additive manufacturing (AM).